A general idea as to how this can be done in a consistent way is explained in the help documents under NonCommutativeMultiply. The thing is that you want to use your operators in an algebraic notation, and that's what that page discusses. Here is another approach that's sort of intermediate between the very simple D[#,x]& scheme and the more complicated realization of an operator algebra in the linked reference from the documentation. For simplicity, I always assume that the scalar is given as the first argument, and the second argument is an operator, e.g., dx etc. Note that the arguments here are not x or y (the assumed independent variables on which functions depend), because multiplyOp maps operators onto operators. Both addition and multiplication are mapped back to their usual meaning in these functions, by defining how the combined new operators act on a test function f1 (which is in turn a function of x, y, and z - depending on the dimension). This is the correct result (the result quoted originally in the post was actually missing an x). Note how I added the scalar z above: in this syntax, it first has to be made into an operator using multiplyOp[z, Identity]. The Identity operator is very useful for this. Of course these expressions with addOps and multiplyOp aren't as easy to read as the ones with simple + signs, but on the bright side it can also be beneficial pedagogically to separate the "operator operations" clearly from the operations between the functions they act on. I'm relying on the fact that ⊙ has higher precedence than ⊗ which in turn has higher precedence than ⊕ (according to the documentation). Here's an approach I've been playing with that attempts to mimic traditional notation for these kinds of operators. The exposition is a little long, but the payoff is a very natural approach to handling operators. a. I use a TemplateBox so that editing of the \[PartialD string is prevented. b. I use "\"\[PartialD]\"" instead of just "\[PartialD]" so that input parsing works as expected. c. I use ShowStringCharacters->False so that one doesn't see the quotes I added above. d. The InterpretationFunction includes an operator wrapper that will be discussed later. Differential operators don't commute with expressions, e.g., $\partial ⋅ x \neq x ⋅ \partial$, so I will use CenterDot for composition of operators. I haven't included it here, but the next step is to perform simplifications of the CenterDot objects, in particular so that commutators can be defined. EDITED: Composition of operators is only on conmutative operators, derivatives are not. Not the answer you're looking for? Browse other questions tagged custom-notation operators or ask your own question. 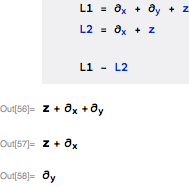 How to define a differential operator in Mathematica? How to define a non-standard algebra in Mathematica? 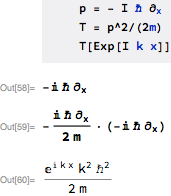 How can I translate a MathWorld statement into Mathematica syntax? Why can't I define a commutator operator in this way? How to create operator variables and lists of operators?